We have long admired Barbara Huber’s clever handbag patterns. As a special treat to you, we are offering her patterns at 20% off for a limited time. 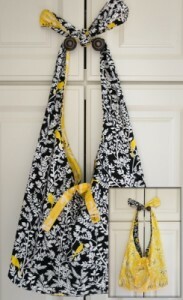 Visit QuiltWoman.com to see all of Barbara’s patterns. Recently, I had a chance to get to know more about Barbara and her creative process. Here is what she had to say. QW.com– At what age did you begin sewing? What was the biggest challenge as a beginning sewer? Barbara Huber (BH) – I began sewing at about age 13 or 14. My mom is a talented seamstress and always emphasized good technique in sewing. My impatience and lack of attention to detail meant that I spent a great deal of time as a young sewer with a seam ripper in my hand. I am grateful for those lessons learned early on because I would not be the sewer that I am today without great guidance in the beginning years. 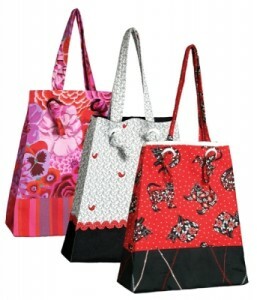 QW– You design a lot of hand bag and tote patterns, what inspires you to create them? BH-I love purses but I don’t always like the prices of purses. My first pattern, The Knot Handle Reversible Tote, was inspired by an overpriced, poorly made sack that I saw in an upscale shop. I thought that I could do a better job so I went home, grabbed some muslin and went to work. I also love the fact that an individual can take one of my patterns and make a bag that is completely unique…a one of a kind. I always try to include ideas for customizing my bags in the patterns so that each sewer can truly end up with a “designer original.” I hope that my patterns are just the beginning in a creative process that results in a beautiful project. QW– If you had more time to sew, what would you make? 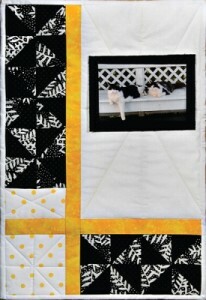 BH-I would love to make a Baltimore Album quilt but think that I need to work on my applique before I tackle one. Maybe when I retire…..
QW- What inspires y0ur designs? Each one is so different from the next? BH-I find inspiration in many places. I always carry a notepad with me and if I see an element in a purse or tote that I like, I write it down. The idea for the Napa Valley Picnic Tote grew out of necessity. My husband and I enjoy concerts and performances in parks and were tired of lugging a big cooler. I try to design bags that I would like to carry and that have some unique elements that are interesting and fun to sew. BH– I always have several projects going at the same time. One is contemporary quilt that I am making for my daughter and her fiance. This project is still in the planning stages. Another is a batik quilt that was a block of the month from about a year ago…I got a little behind! Most of the blocks are finished but I have quite a bit of work to do on the settings for the blocks. I always have some hand work around too. My favorite is wool applique. BH– “We make a living by what we get, but we make a life by what we give.” – Winston Churchill. This quote says it all for me. It’s important not to get so wrapped up in “getting” that we forget to give back. BH– For me, any time spent with my family is treasured. My son, daughter-in-law, my daughter and future son-in-law all live out of town so when my husband and I get everyone together it is a special treat. Having everyone at our cottage on Lake Chautauqua in NY is always fun. We don’t need to be doing anything extraordinary. Just being together is a perfect day for me. Thanks so much for joining me for my chat with Barbara Huber! 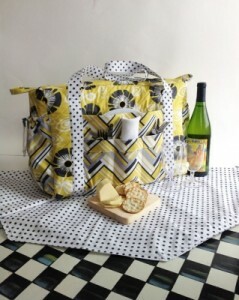 This entry was posted in Designers, QuiltWoman and tagged barbara huber designs, Cape Cod Mini Bag Pattern, Knot Handle Reversible Tote Bag Pattern, Memory Quilt, Napa Valley Picnic Tote Bag, QuiltWoman. Bookmark the permalink.